Howarth Timber & Building Supplies are delighted to nominate the Howarth At Home Corby showroom for the BMJ Kitchen & Bathroom Showroom of The Year award. The Showroom has undergone a dramatic remodelling in 2017 accompanied by a spectacular launch event, now serving as one of the flagship showrooms for Howarth At Home and the Laura Ashley Kitchen Collection. 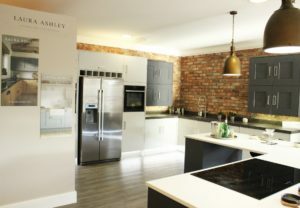 As one of the largest kitchen showrooms in the group, Howarth At Home Corby underwent a number of significant developments as part of their refurbishment that mark it out as a premier display for the new collection. The showroom is now split into two distinct wings, with the exquisite Laura Ashley Kitchen Collection housed in a dedicated space, bringing unrivalled space and diversity. 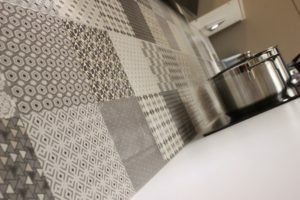 Already proving to be a big hit with customers, Howarth At Home Corby has seen a dramatic increase in both visitors to the showroom and orders, requiring an additional designer to be brought into the showroom to keep up with demands. The kitchen sets are displayed with products and furnishings sourced from Laura Ashley stores to complete the look to an exceptional standard and ensure that the displays are stylistically cohesive and help the customers to envision the kitchen in their own home. The showroom relaunch event generated a great deal of interest in the local area and resulted in large footfall to the new showroom. Chef Kev Hillyer was present on the day with a live cooking demonstration and additional suppliers were present on the day with their own products and competitions. A social media campaign the week before the relaunch achieved a reach of 52,500 within a 10 mile radius of the branch to a segmented target audience. A campaign in local Living magazines accompanied the event to both promote the launch event and raise awareness of the revised showroom. For the first time in its history, Howarth At Home Corby now features Bedroom displays, with the Laura Ashley Bedroom display taking a prime position in the new wing, alongside a uniquely designed boot room, designed to show the flexibility of design. The changes have generated huge local interest in the area, with orders coming from as far as a 30 mile radius around the branch. Howarth At Home Corby benefits from the expertise of Kitchen Showroom Manager Sue Crewe, who’s passion and drive has helped to build the customer base of the showroom in the area, as well as significantly increase enquiries and orders. The surge in interest in the local area has more than doubled the amount of quote requests received by the branch, leading to the need to add an additional designer in branch. The relaunched showroom is complemented by the brand-new Howarth At Home website, allowing customers to view the full range, book an appointment with an experienced kitchen planner and even design their ideal kitchen with advanced kitchen planner software. The brand-new website marks another step forward for Howarth At Home, further establishing themselves as a go-to specialist in the region.